Hand Forged Strap Hinges are made 12″, 18″, 24″, 30″, and 42″. Custom Lengths and offsets are available. Dead bolt functions include Removable Bit Key, and Thumbslide inside, Rim Cylinder outside. Please Specify left or right hand when ordering. Dead Bolt functions include Removable Bit Key, and Thumbslide inside, Rim Cylinder outside. Sold standard with 1 ¾’’ knobs. For 6’’ and 8’’ locks, 2’’ knobs for 10’’ and 12’’. Hand-made Quadrant for custom Dutch Doors. Many finished available, your designs can be submitted through our website. Many Finish options available. Please call us for different mounting options. D. C. Mitchell has been producing quality reproductions of period hardware for over 20 years. Our line of hardware includes 18 Century furniture and building hardware. 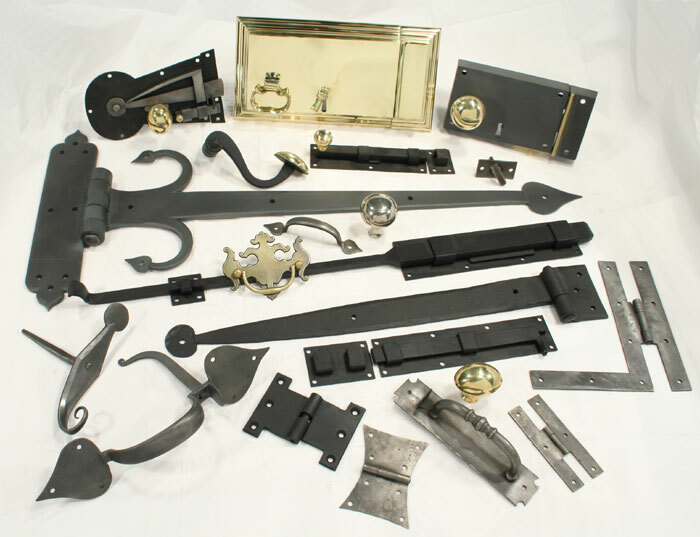 We have the ability to make all kinds of Brass, Iron, Bronze, and Stainless Steel hardware. All of the products displayed on this page have been made in our shop in Delaware. D. C. Mitchell serves many industries including: architectural firms, building contractors, furniture conservators, home owners, antique shops. 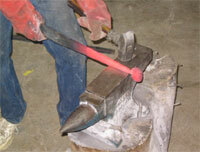 Hand Forging a Strap Hinge. Since our start in 1982, we have been increasing the capabilities to include: sand casting, die casting, hot forging, machine tool work (CNC, screw machine, and manual machining) press work, plasma cutting, welding, metal finishing (belt sanding tumbling antique patina) These resources allow the craftsmen at D. C. Mitchell to create a wide variety of products. Customers can go to dcmitchell.org to order products. Customers needing special hardware may fax drawings of items to 302 994 0178 for pricing and delivery. We will answer any questions about products or services at 302 998 1181. Available finishes: Brass products may be finished bright, highlighted antique, or antique. Iron products will be sent out with black paint or a natural finish with a clear coat to prevent rusting. Rim locks: Are locks are available in brass or iron, Horizontal 8” and 6” and Vertical 5 ½”. Privacy locks have a dead bolt operated by thumb side inside, and rim Cylinder or 6” bit key outside. Passage locks (without dead bolt) may be used for latching purpose. Special keepers or strikes can be made for different door trim and door swing conditions. Molded edge brass locks are also available. Hinges: All of our iron hinges are rolled to the back and lap welded. Strap Hinges are made from bar stock from 1/8” thick for 12” length to 5/16” for 42” length. Four different types of pintles are available. Straps can be supplied curved for arched doors or engineered to offset around special woodwork or masonry.